Using a wavy edge ruler or scissors, cut 2 cranberry, and 2 evergreen borders, 12 inches in length and about 1 1/2" across at the widest part. Adhere them to the outer edges of your page with the two cranberry pieces on the top and bottom, and the two evergreen pieces on the left and right. Don't worry about how they overlap in the corners, this will be covered up with the square pieces later. Using a paper trimmer, cut two cranberry gingham and 2 evergreen gingham squares (2 1/4" X 2 1/4"). Next, cut out the pattern pieces along with your decorative paper: Gingerbread boy--Use dark brown paper and decorate using an opaque white pen. 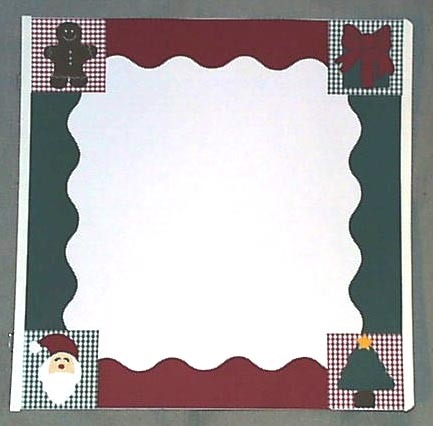 Adhere gingerbread boy to a cranberry gingham square, present pieces to an evergreen gingham square, tree pieces to a cranberry gingham square, and santa pieces to an evergreen gingham square. Adhere squares to the corners of your page.